At the beginning of the 20th century, cider was the #1 beverage in America. Then came Prohibition, which resulted in America’s cider apple orchards being destroyed. When people here began making cider again in the 90s, culinary apples were the only ones widely available. That’s why American ciders today are known for being overly sweet, syrupy and guaranteed to give you a hangover if you drink more than one. For comparison, it would be like trying to make a fine wine using only store-bought grapes. 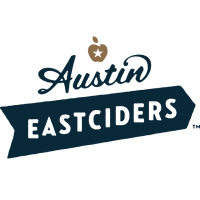 We make Austin Eastciders the traditional way, using white wine yeast and real cider apples that we source from Europe. Unlike culinary apples, cider apples are full of tannins that create astringency and a much more complex flavor profile. We then marry them with apples from Washington State for a perfectly-balanced cider that’s dry, clean, crisp, refreshing and tastes almost too good going down.